Stephen Curry thinks "it's never too early to get that fire going" after Steve Kerr was ejected in the Golden State Warriors' preseason defeat to the Phoenix Suns. The reigning NBA champions lost 117-109 at Oracle Arena on Monday and Kerr was sent to the locker room for entering the court in protest at an offensive foul called on Curry early in the third quarter. The Warriors coach, who left Klay Thompson and Draymond Green out for the game, appeared to tell the officials "I don't want to be here" before waving goodbye to referee Ben Taylor. Asked for his reaction to Kerr being ejected in a preseason game, Curry said: "I love it, I love it. We've got a good vibe going about what we're doing. It's never too early to get that fire going, so we'll see how we sustain that throughout the year. "Obviously when a blatant call he thinks should go one way and it goes the other he's going to have a reaction to it, it doesn't matter if it's preseason, regular season or playoffs. It's nice for him to have that fire, for sure. "We're all in this together and we have to have each other's backs. He has an opportunity to influence things with outbursts if he needs to or something he says in the locker room, whatever the case may be. "Knowing when we're out there giving it everything we've got throughout the year [that the] coach has your back, not pinching his wallet when he has an opportunity to speak his mind, that means a lot." Balanced scoring helps the @Suns win in Oakland! 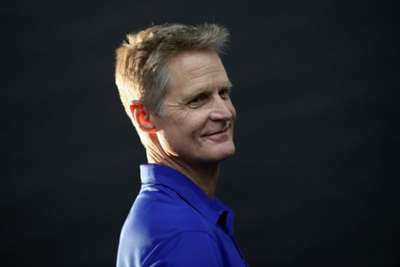 Following his remarks to the officials, when Kerr was asked by the media after the game where he did want to be he responded in light-hearted fashion. "Back in the locker room - we had a good post-game spread that's usually out there by late in the third quarter so I wanted to be the first one to the buffet," he joked. In a more serious tone, Kerr added: "He called an illegal screen. There were a lot of those tonight and I was frustrated. I was in the wrong, obviously, I got what I deserved. "I was trying to make a point, I was trying to back-up my guys. We had all these offensive fouls one after another and I'd finally had enough."